DUBAI, United Arab Emirates — A tiny speck more than half a mile (800 meters) in the air, a French skyscraper climber successfully scaled the world's tallest building Monday, even navigating the tapered spire that extends beyond the top floors of the Dubai structure. French Spider man Alain Robert climbs up Burj Khalifa,the world's tallest tower in Dubai, United Arab Emirates, Monday March 28, 2011. Just before sunset Monday, a French skyscraper climber who calls himself "Spiderman" started to pull his way up the side of the world's tallest tower in Dubai. Alain Robert's climb up the 2,717 foot-tall (828 meter) Burj Khalifa, took just over six hours. As night fell, a row of powerful spotlights shone on the side of the tower as Robert climbed. The unusually high wind speed being witnessed across the UAE and particularly at Burj Khalifa will not hamper this evening’s attempt to scale the world’s tallest tower, Alain ‘the Spiderman’ Robert told Emirates 24|7 on the eve of his astounding attempt. A French skyscraper climber nicknamed Spiderman hopes to reach new heights next week by scaling the world's tallest tower in Dubai. 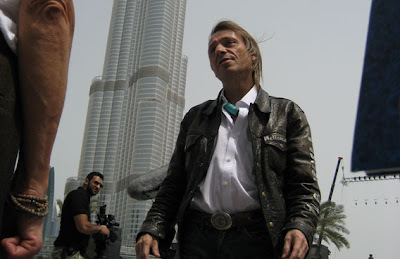 The Emirates' Higher Colleges of Technology said on Thursday that climber Alain Robert has been given approval to climb the 2,717 foot-tall (828 metre) Burj Khalifa during the institution's Education Without Borders conference. Unlike on many of his previous climbs, Robert said he will use a rope and harness on Monday's ascent to comply with organisers' requirements. He has been arrested and fined numerous times elsewhere after scaling buildings without safety equipment. "I was trying and trying to get the approval, and it was always a big, big no," he told The Associated Press about the Burj Khalifa climb. "At least this is still pleasant, it's a performance. This is still the highest building in the world." A seven-year-old boy who is dying from a brain tumour is set to fulfil his last wish by travelling from America to Dubai to visit the Burj Khalifa. Noah Larkin has been infatuated with the world’s tallest building since he can remember and is determined to go up the 828m structure so he can feel “on top of the world”. His mother Amber said: “When he was four he wanted to research the tallest building in the world and his love for Dubai was born. We watched the construction of the Burj Khalifa tower on the internet. Every week we would look for new YouTube postings,” she said. Dubai Constructions Update by Imre Solt: I want to be on top of the world - National News ,...: "I want to be on top of the world - National News"